Agricultural systems, like the natural systems they mimic, are highly dynamic, each small change ripples through many interconnected pieces of the whole picture. Comparatively adding a year of small grains production into a corn and soybean system is a pretty massive change – therefore we can’t expect the corn and soybean production in that system to stay the same. 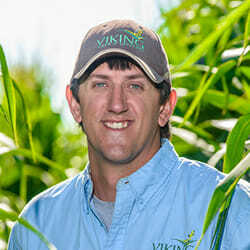 Jake Hansen coordinates corn and soybean testing and evaluation for Albert Lea Seed. In January, our small grains shared learning call focused on a main winter-time task for farmers everywhere – seed selection, not for small grains, but the corn and soybeans that follow that small grain in the rotation. Jake Hansen and Margaret Smith from Albert Lea seed joined us to speak about the opportunities and trade-offs of selecting corn and soybean varieties for extended rotations. Their considerations fell into three main groups – selecting maturity groups, traits for insect resistance, and traits for herbicide tolerance. If you intend to plant a winter small grain like wheat, rye or triticale the optimal planting date is between Oct 1st and 15th. In many years, corn and bean harvest is still happening at that time, making it difficult to establish a good stand of small grains going into the winter. Selecting a shorter maturity group or hybrid for soybeans and corn can help get the small grain in on time. In corn there three kinds of genetically engineered traits – one protects against corn borer, one against corn rootworm and the third provides herbicide tolerance. The first two address insect pests. 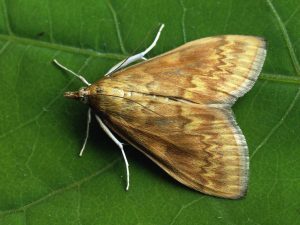 Corn borers are lepidopterous, from the same family as moths and butterflies. This means that they can fly between fields to find new corn for their larvae to feed on, so they are not well controlled by rotation. To control corn borers, growers must scout aided by tools such as Iowa State’s monitoring of corn borer flights. Luckily corn borer infestations remain relatively rare in Iowa, though Jake cautions, we are on an upswing of corn borer incidents across Nebraska, Minnesota and even Iowa. Rootworm, in comparison, has a more sedentary lifestyle and therefore can be controlled with rotation. Corn rootworm begins and ends its life in the soil. 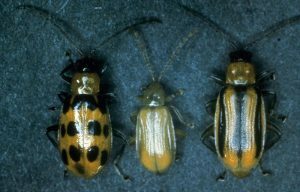 The eggs hatch and larvae feed on corn roots, then the insect transforms into a beetle which emerges from the soil and flies directly upward to feed on corn before turning right back around and burrowing back into the soil to lay eggs and die near where it emerged. The eggs then overwinter and emerge the following year for western corn rootworm. So these rootworms are of main concern in a continuous corn system and can still be controlled with a two year, corn-soybean rotation. There are three kind of corn rootworm pictured here in their adult beetle stage. From left to right, the southern corn rootworm (diabrotica undecimpunctata howardi), northern corn rootworm (D. barberi) and western corn rootworm (D. virgifera virgifera). In the Upper Midwest, the latter two are pest concerns. Some northern corn rootworm populations have developed a genetic adaptation called extended diapause that allows the egg to lay dormant in the soil for not one but two years and then hatch. This is particularly troublesome for corn and soybean rotations because the insect can coincide precisely with corn every other year. Extending the rotation a third year with a small grain puts corn outside the reach of the Northern Corn Rootworm – and allows farmers to purchase seed without root worm resistance. “Traits come with an added cost!” Jake says. “With farm economics the way they are it’s always helpful to cut costs somewhere.” In an extended, three-year rotation a farmer can confidently leave the rootworm trait on the shelf and save a bit of cash in the process. Another big benefit of extended rotations is the cool season life cycle of the small grain wreaks havoc on weeds that have become comfortable in the warm-season-only corn and soybean system. “Extended rotations break up the cycles for waterhemp, ragweed and palmer amaranth,” Jake says. This can help farmers keep weed control costs down and prevent the development of herbicide resistant weed populations. 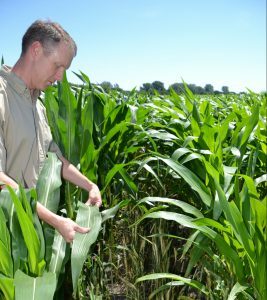 This may not happen in the first year or second of growing an extended rotation, but over time weed populations change enough that farmers can drop herbicide tolerance traits from corn and soybeans altogether – and potentially access the premiums of the Non-GMO market in doing so. But, not all weeds are controlled by the magic of an extended rotation – there will still be a need for cultivation or chemicals to control weeds and if herbicide tolerance is dropped in your seed selection, the chemical options for weed control are much more limited. Any herbicide applied to kill the weed may be in danger of killing the crop too! Brent Larson, who farms near Fort Dodge offered that in his non-GMO soybean fields he uses Sonic® or Authority® as a pre-emergence herbicide and Flexstar® or Cobra® as a post. Clethodim and Zidua® Pro are also options for non-GMO soybeans. 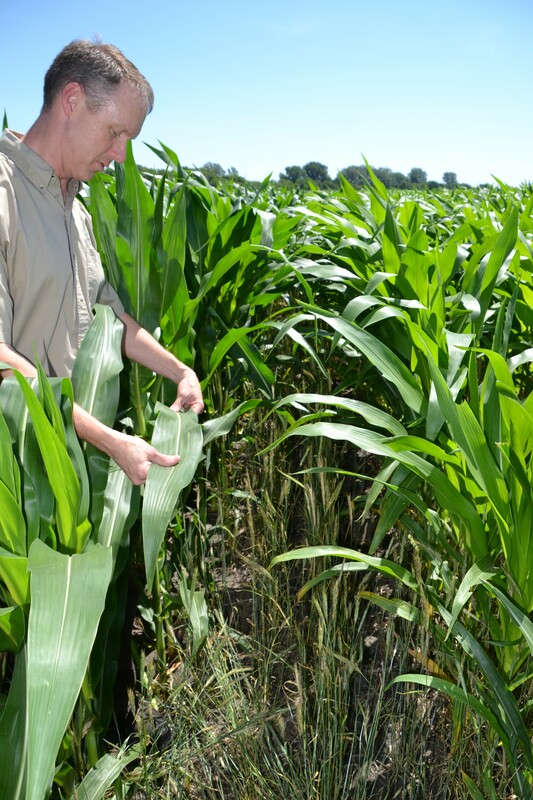 Farmer Brent Larson inspects his non-GMO corn in a field where a rye cover crop was terminated after corn emergence using Corvus® and atrazine with methylated seed oil. If you’re thinking about trying to go non-GMO with corn and soybeans, an extended rotation offers good conditions to do so successfully. The rotation helps keep pests, both insects and weeds controlled so the insect and herbicide traits are no longer as critical to raising a successful crop. But, “If you do away with the traits you should go back to a scouting system, if you’re not already doing it,” Jake said. Regular assessment of pest populations will allow quick action should a pest pass threshold levels because they were not adequately controlled through the rotation itself. Shared learning calls are held from noon – 1 pm on the first Friday of the month on topics related to adding a year of small grains to a corn and soybean rotation. If you’d like to receive updates about upcoming calls sign up for our monthly small grains e-newsletter. If you’d like more information about small grains production, markets or our cost share program please visit Practical Farmers’ small grains page. Inclusion of a chemical product in this blog is not an endorsement of a product nor is exclusion non-approval.